In this Oldur Build Guide, we provide an overview of his strengths, abilities, Battlerites and matchups. Oldur is an incredibly challenging Support to play, who differs a great deal from the likes of Lucie or Poloma. What he lacks in healing potency he more than makes up for in damage and crowd control. With high basic attack damage (that provides a strong damage over time effect), alongside valuable reflects and slows, he has a kit that can frustrate. Oldur is a mysterious creature able to bend time and space. He can mend wounds with powerful heals and reverse enemy attacks by freezing them in time. Despite that potency, Oldur is difficult to succeed with. Little personal shielding outside of Time Bender, he needs exceptional use of Shifting Sands in order to survive. That said, as long as you can reliably apply his DOT to all enemies, while counting on your team for the occasional peel, he can be a fun, and viable Champion to play. Sands of Time (LMB) - Sands of Time has two effects. The first is impact damage, the second is damage over time caused by it. With the impact damage of Sands of Time being low, Oldur relies on the DOT to surpass the damage potential of other Support Champions. The total damage, from the first impact to the end effect is 20. However, this is only possible if Oldur maintains the DOT. If Oldur continually hits the same target with Sands of Time, it won’t cause more damage, but will simply refresh the DOT effect. Ideally, you want to spread Sands of Time to as many targets as possible and once it’s applied, use the time to heal, reposition or crowd control your opponent. Rejuvenating Sands (RMB) - By default Rejuvenating Sands is weaker than most other Supports. For example, Lucie’s Healing Potion heals for 14, but also applies an instant healing over time effect by default. Alternatively, Ulric heals for 14 immediately but can bolster this massively thanks to Favor. This places Oldur at a slight disadvantage over his peers, meaning he heals for less without key Battlerites. That said, it’s still sufficient at sustaining yourself and your team as long as they don’t suffer too much burst damage. Try to always keep your team’s health topped up, and remain in line of sight so you gain the cooldown reduction. Shifting Sands (Space) - Shifting Sands is Oldurs only mobility, outside of his Ultimate, and allows him to pass through allies and enemy Champions (it acts as an i-frame). The travel distance isn’t far on Shifting Sands, but it does allow you to pass through scenery. Better still, it also heals allies you come into contact with, and damages any enemies. Due to the lengthy cooldown of Shifting Sands, you should only really use it when it’s absolutely necessary. If you can, try to always return to an ally instead of away from them. Moving out into the open or an obvious location will see you punished incredibly quickly. It’s also worth noting that if you do choose to dive through an enemy in order to damage them, you need the ability to get out afterwards. Time Bender (Q) - Oldur’s second defensive ability, Time Bender, allows him to mitigate incoming attacks. For its duration, he will nullify any ranged or melee damage against himself. In addition, the shield absorbs a single projectile which Oldur can then re-release back against his foes. As it can only absorb one projectile, it’s important not to waste Time Bender on basics (such as Jade’s revolvers), but instead, use it to mitigate a high impact attack such as Jade’s Snipe. Due to the nature of Time Bender, it’s also worth body-blocking with it for your team, as it’ll buy allies significant time. Finally, while you can turn with Time Bender, feel free to cancel it early if you have to. Quick Sand (E) - Quick Sand is a long range projectile that’s a core component of Oldur’s kit. Allowing Oldur to deal high impact damage, while consuming Sands of Time and causing a snare, it’s integral for surviving or bursting opponents. Despite having a long range, the travel time of Quick Sand is fairly slow so it’s often easily avoided, or requires exceptional aim. That said, if you can use it immediately after your Ultimate, it’s more than capable of dealing very high damage (Time Travel > Sands of Time > Quick Sand > Chronobolt as a typical rotation). If necessary, it’s often worth saving Quick Sand for the snare component so you can escape melee Champions. Stone Glass (R) - Stone Glass has a clear telegraph (Oldur lifts his lantern over his head) and can be avoided by skilled players. Despite that, it’s fundamental for buying Oldur time and removing one Champion from play, for a short period of time. It’s often worth hitting a melee Champion with Stone Glass and then simply walking away. Using Quick Sand will leave you without both your “outs”, so get into the habit of just reposition once you shut someone down. Chrono Bolt (Shift + LMB) - Chronobolt is a niche EX ability that you won’t often use. It’s cost at 25% Energy is high, and its only real value is to burst a chunk of health and a minor knockback. It’s fairly hard to hit unless an enemy is slowed, so it’s often only worth using during your Ultimate combo. By all means use it if you can guarantee it’ll land, just don’t deprive yourself of the opportunity to use Stone Glass. Chronoflux (Shift + Q) - Chronoflux is the strongest EX ability for Oldur and one of his most powerful. Allowing him to reflect any projectile, regardless of the quantity, it can protect him and his team. Used at the right time, it’s incredibly strong versus Jade or Destiny, and can buy him time to reposition or punish his opponents (it’s ridiculously strong versus Iva’s Machine Gun). Oldur’s Chronoflux also slows enemy movement, and “boops” an enemy caught in its spawn, to one side. This buys you time to escape, reposition or kite an opponent. Just be sure to have some Energy at the ready if against a range-heavy composition. Time Travel (F) - Time Travel isn’t just an Ultimate ability that allows you to stun or move away from enemies, but also increase cooldown reduction by 25%. Whether used to remove yourself from play to reposition, or to lock down one enemy Champion to then burst them down. Considering Time Travel allows you to remove one of your team from play (including yourself), it’s also good to use it on an ally who’s under heavy pressure. At the very least, they’ll be able to escape and return to you. Oldur deals high damage, and his DOT effect from Sands of Time lasts for a fairly lengthy period of time. Dehydration allows him to bolster this, by reducing the healing receive by 20% for anyone under its effect. Better still, it also reduces their damage by 10%. The key to maximizing Dehydrations value is maintaining your Sands of Time debuff. Renew allows Oldur and his Rejuvenate (HOT effect) to heal for 15% more when an ally suffers damage, up to a maximum of 6 bonus health. For anyone suffering damage, Renew helps sustain them. Providing Oldur and his allies with a shield when he passes through them using Shifting Sands, Recreate provides some much needed sustain and mitigation. While the shield value isn't enormous, it will mitigate a basic attack or two and reduce the need for you to constantly heal. Sandstorm allows Oldur to slow anyone he hits with Sands of Time, after using Shifting Sands. Not only that, but Sandstorm also ensures his next Sands of Time deals 6 additional damage. While it's an aggressive Battlerite, it does allow him to kite when needed, or deal that little bit more damage. The burst potential of Oldur is high, especially when he stuns an enemy Champion with his Ultimate. Time Burst allows him to eat a huge chunk of a players health as long as they're already suffering from Sands of Time, and he then lands Quick Sand. These Hero Threat Levels (1 being lowest threat and 10 being highest threat) are to help you determine which enemy Heroes can give you a headache. For the Heroes listed here, take extra care as they're particularly dangerous for Oldur. 1. Oldur's strongest rotation is Time Travel > Sands of Time > Quick Sand > Shifting Sands. In total, it deals 60 damage instantly. 2. Try to apply Sands of Time to all enemy Champions. It's often not worth spamming it against a single one, unless they'll die in the process. 3. The DOT component on Sands of Time delivers at the end, rather than through the duration. Elongating the duration denys the final effect. 4. 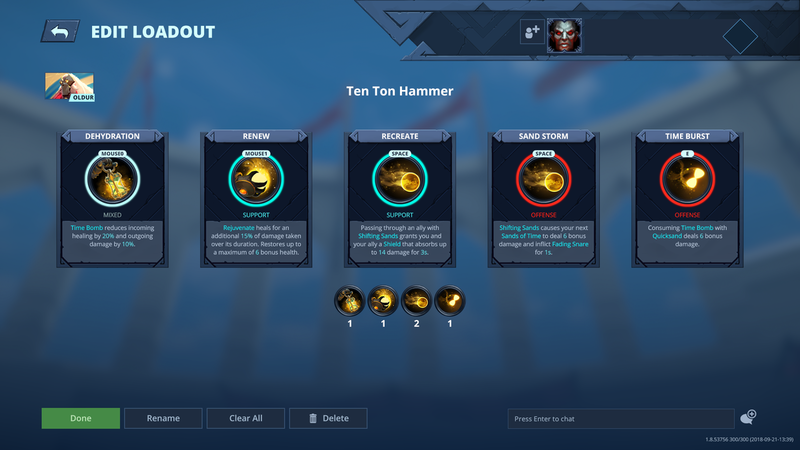 Rejuvenating Sands heals for a flat 14 health and has 3 charges. Stay in line of sight of your team so you can reduce its cooldown. 5. Rejuvenating Sands cannot heal past scenary (unlike Sirius'). Encourage your team to stay in range. 6. Shifting Sands has a very long cooldown. Try to use it last, and not just to heal a minor wound on a team-mate. Wasting it early will leave you incredibly vulnerable. 7. Always dive back to your team, or through scenary when using Shifting Sands. You need to create space between you and the enemy. Diving away from your team will leave you very vulnerable. 8. If you don't pass through an enemy or ally with Shifting Sands, you will not trigger the Energy gain from the ability. 9. Don't use Time Bender just to block minor basic attacks. You can typically heal through these 1 on 1. Use it to negate big hits, or to stop a key ability (such as Rook's Rush). 10. Try to stand between your team and the enemy when Time Bender is up. It'll mitigate all incoming damage and buy your team time. 11. You turn fairly slowly with Time Bender active. Feel free to cancel-cast it once it's activated. 12. When hit by a melee Champion, Time Bender will knock them back. If you quickly cancel-cast at that very moment, you can run away to create a lot of space between you and them. 13. Quick Sand does not trigger counters. Use it against Champions such as Destiny and Sirius, just be sure not to hit them with a Sands of Time after. 14. Chronoflux appears instantly when you cast it. Use it in a pinch to deny a high damage projectile. 15. Chronoflux will also "bump" you and an enemy out of its bubble, before slowing. Use it to create some space if needed. 16. If you're going to use Time Travel, be sure to have Quick Sand ready. You need it for when you land your stun.